Demo, pre-owned equipment for sale! Would you like to see our Digital Printers, Coaters, Feeders, Creasers, in action? 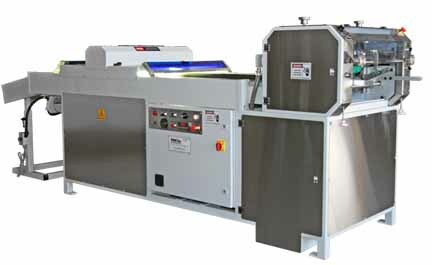 Would you like to see your substrate printed, coated, creased, slit? Would you like to produce a job for your customer? Would you like training prior to purchasing? These are some of the reasons for our demo facility. You are welcome to visit us and coat your substrate. We have a wide format Digital Printer, two Coaters 16" and 20" plus a Crease Master Pro, Deep pile feeder in our demo facility for you to see and run. The equipment is user friendly, majority of your staff can run it. Any time, please contact our customer service department 800.889.6887 to set up an appointment for a one on one visit. When it comes to producing the best in point of purchase graphics, indoor & outdoor vinyl banners, OEM markings, car wraps and customized prints, production printers rely on our equipment to fullfill the latest demands of their customers. Reduce the expense of 3rd party coating companies, and dealing with backlogs. We have a variety of UV Roller Coaters from 14" to 80". Our full range of UV coating will make it easy for you to take on any job with complete confidence. National UV Supply Co, is an industry leader offering the latest tecnology and service for our customers. Please give us a call 800.940.6887 or send an email.